Laverne & Shirley was one of the rare spinoffs that eventually surpassed its parent series (Happy Days) in the ratings. Despite its popularity, there was a lot of unhappiness behind the scenes, due mainly to the sudden success of the show. Luckily time has healed most of those old wounds and the cast members are all on friendly terms today. We spoke with series co-creator Mark Rothman, who helped us uncover some things you might not know about the beloved sitcom. 1. THE GENESIS OF THE SHOW DATES BACK TO AN UNUSED SCRIPT FOR ANOTHER SITCOM. Paul Sand in Friends & Lovers was a short-lived sitcom that ran from September 1974 to January 1975. Sand played Robert Dreyfuss, a nebbishy musician with the Boston Symphony, and Penny Marshall played his sister-in-law, Janice. Mark Rothman and Lowell Ganz wrote an episode for the show that featured Robert, who is somewhat shy and awkward, trying to pick up women in a supermarket. The script was ultimately not used, because the producers felt it made the title character appear to be a little too much of a loser. 2. THE UNPRODUCED SCRIPT WAS REPURPOSED FOR AN EPISODE OF HAPPY DAYS. After the Paul Sand show was canceled, Garry Marshall’s mother began to pester him about his sister being out of work, and couldn’t he help her out somehow? Rothman and Ganz were writing for Happy Days at the time, and Marshall brought up the idea of incorporating parts of the Friends & Lovers script into a Happy Days episode. The result was “A Date with Fonzie,” in which the Fonz summons two “loose” girls from his little black book to go on a double-date with him and Richie (who was in a dating slump). The two girls, played by Penny Marshall and Cindy Williams (who had co-starred with Ron Howard in American Graffiti two years earlier) were christened “Laverne DeFazio” and “Shirley Feeney” and were an immediate hit with the studio audience. 3. THE SERIES WAS ACTUALLY PITCHED BEFORE THE HAPPY DAYS EPISODE HAD AIRED. Garry Marshall bumped into ABC chief Fred Silverman at an industry event not long after “A Date with Fonzie” had shot, who asked Marshall if he had any new show ideas to help build a solid Tuesday night comedy block for the network. Never one to be caught off-guard, Marshall replied that he had an idea about two single blue-collar girls who worked as bottle-cappers at a brewery. Silverman liked the concept and ordered a pilot on the spot. Marshall had Rothman and Ganz write a 10-minute scene, which was later filmed in Fonzie’s apartment on the Happy Days set immediately after the taping of the “Arnold’s Wedding” episode. In fact, Marshall personally stepped onstage and asked the studio audience to remain in their seats to watch “a scene from a new show” that he hoped they’d like. Despite “A Date with Fonzie” not having aired yet and thus the Laverne and Shirley characters being totally unknown, the audience reaction was very positive, and everyone involved sensed that they had a hit in the making. 4. ANOTHER WILLIAMS ALMOST PLAYED SHIRLEY. Cindy Williams started to have second thoughts about signing on for a TV series once it looked like the show might be greenlit. She still had her eye on a film career, plus she was leery about working with so many of her co-star’s relatives in charge. Other actresses were tested for the role, with one, Liberty Williams, making it as far as filming the 10-minute pilot scene with Penny Marshall. But the chemistry between Cindy and Penny had been so strong that producers ultimately agreed to Cindy’s high salary demand and request for equal, but staggered, billing: Penny’s name appeared first, but Cindy’s name appeared higher onscreen. 5. THE OPENING “SCHLEMIEL, SCHLEMAZEL” CHANT CAME FROM PENNY’S CHILDHOOD. Penny Marshall has no recollection of where it originally came from, she just knows that it was something she and her sister, Ronny, used to chant during their seven-block walk to school in the mornings when they were kids. 6. PHIL FOSTER WASN’T EVERYONE’S CHOICE TO PLAY LAVERNE’S DAD. Back in the 1950s, when Phil Foster was working as a stand-up comedian, he gave Garry Marshall his first job as a comedy writer. Marshall repaid the favor when casting Laverne & Shirley by hiring Foster to play Frank DeFazio. Writer/producer Mark Rothman told mental_floss that he was on board with the choice, but some of the higher-ups at ABC were not. Foster mumbled and had a thick Brooklyn accent, so they feared viewers would not be able to understand him. (Rothman’s second choice for the role was singer Frankie Laine, who’d caught his eye recently on a rerun of Make Room for Daddy.) In the end, Foster was signed and it was decided to make a running joke of his almost unintelligible thick “Italian” accent. 7. LENNY AND SQUIGGY’S ORIGINAL ACT WAS NOT FAMILY-FRIENDLY. Michael McKean and David Lander met while working together (along with Harry Shearer) in a comedy troupe called The Credibility Gap. One of their “bits” was about two characters named Lenny Kosnowski and Anthony (pronounced “Ant’ny”) Squiggliano. The voices and posturing were much the same as Lenny and Squiggy's, except that the jokes were extremely blue, full of profanity and sexual references. 8. 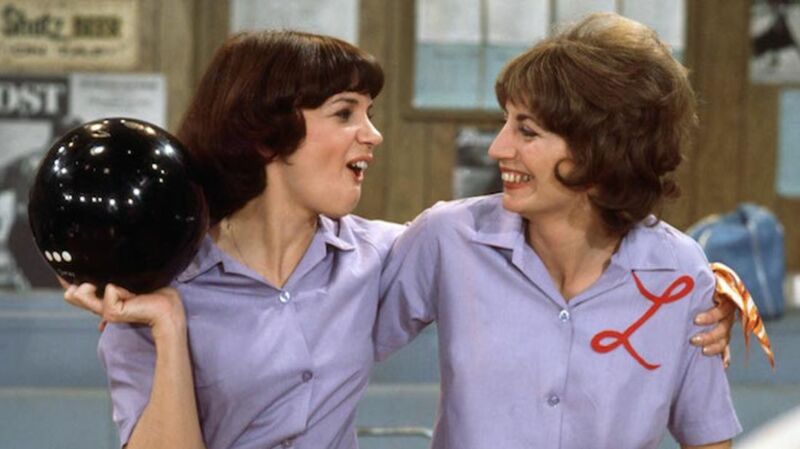 LAVERNE AND SHIRLEY WERE “RE-VIRGINIZED” FOR THE SERIES. 9. THE GIRLS WEREN’T SO SWEET AND INNOCENT OFF-CAMERA, THOUGH. Garry Marshall frequently brought his young children to visit Stage 19 at Paramount Studios to watch Happy Days being filmed, but he forbade them from venturing over to Stage 20, which was Laverne & Shirley territory. The Happy Days cast and staff were almost as wholesome in real life as they appeared onscreen, but the Laverne & Shirley actors’s off-camera dialogue was peppered with foul language unsuitable for tender young ears. There was also some bad behavior at times, particularly between the cast and the writers. Scripts and temper tantrums were thrown, production was delayed. Cindy Williams’s manager stood offstage timing the laughs and protested whenever Penny Marshall’s lines got bigger yuks from the audience. The series had debuted at number one and stayed near the top of the Nielsen ratings for the first four seasons. Years later, cast members admitted that such sudden success went to a lot of heads and that a lot of the dissension behind the scenes was ego-related. 10. LAVERNE’S “L” MONOGRAM WAS PENNY MARSHALL’S IDEA. When any new show is just getting started, certain facts (like character names, their professions, where they live, etc.) have to be repeated a bit until the audience gets familiar with them. Rather than having to be constantly addressed as “Laverne” (which Marshall thought would get boring and distracting), she came up with the idea of sewing an “L” monogram onto her clothing to subtly remind the audience which character she played. 11. BY SEASON EIGHT, THE SHOW SHOULD HAVE BEEN CALLED SIMPLY LAVERNE. Cindy Williams married singer Bill Hudson in 1982 and soon became pregnant with their first child. Even as her pregnancy progressed, however, she was still working 14 hour days and eventually had to have a hospital bed provided on the set so that she could lie down in between takes. When the producers refused to reduce her workload and even had her scheduled to tape on her due date, Williams left the show. Paramount released her from her contract and Marshall pressed on alone, with Williams’s salary added on top of her own to compensate for her expanded role. 12. THE FINAL EPISODE WAS A BACKDOOR PILOT FOR A CARMINE SPINOFF. Eddie Mekka had been a successful Broadway performer when he moved to Hollywood to try his hand at television. Since his background was in musical theater, his Carmine character was given the occasional song-and-dance number on the show. The series finale, “Here Today, Hair Tomorrow,” featured The Big Ragoo frustrated and getting nowhere with this career as an entertainer in Los Angeles and venturing to New York to audition for the musical Hair. Once in the Big Apple, he takes an apartment with a group of aspiring actors where wacky hijinks would certainly have ensued, had the show been picked up as a series.